We don’t ever seem to learn from history, do we? Yes, we learn this and that technologically speaking, but we don’t learn our lessons, in the sense that the phrase used to apply. As fast as technology tries to solve humankind’s problems and theoretically create a better world, even faster does evil evolve in sophistication, malice, and scope. As far as real goodness is concerned, we seem to continually be taking one step forward and two steps back. Is there no end to it? I long for a better world too, but I just don’t see it happening any time soon. People are too greedy, too self-centered, too prone to take the quick easy way out rather than accept the slower, more difficult long term solution. That’s why the stories in this volume are, for the most part, pessimistic, or at least contain many pessimistic attributes. They are mainly set on hypothetical future Earths, and when I gaze into my writer’s crystal ball I don’t see Earth becoming idyllic and paradisiacal any time soon. I wish, I hope, but I just can’t see it, especially judging by the past and present. Sure, something could happen tomorrow to turn it all around, but do any of us really believe that it will? I don’t think so. In the meantime, though we see evil men prevailing, the environment eroding, economies unraveling, armies warring with one another, we still teach our children to read and write and figure, we try to exercise and eat healthily, we drop our empty beer can into the recycling bin. Hope is what keeps us going. Though we can’t foresee a better future, we hope for one. Otherwise we would just despair, curl up, and die. The hell with that. When I postulate dark futures it is not to get you to despair. When I hold up dark mirrors before your eyes it is not so that you will see the worst in yourself and do yourself in. Far from it. Some of my greatest illuminations have come from deep dark prose. I have written before of Harlan Ellison’s “I Have No Mouth and I Must Scream”, for example, and Cormac McCarthy’s “The Road”. No, dark literature is not meant to overwhelm us. It is meant to purge us, to provide catharsis. It is a cleansing and purifying process. We must be aware of the evil within before we can clean it out, or at least we must get it under control. After all, it’s not how many times you fall but how often you get up that’s important, right? This entry was posted in Uncategorized and tagged Dark Mirrors, dystopia, science fiction, short stories. Bookmark the permalink. 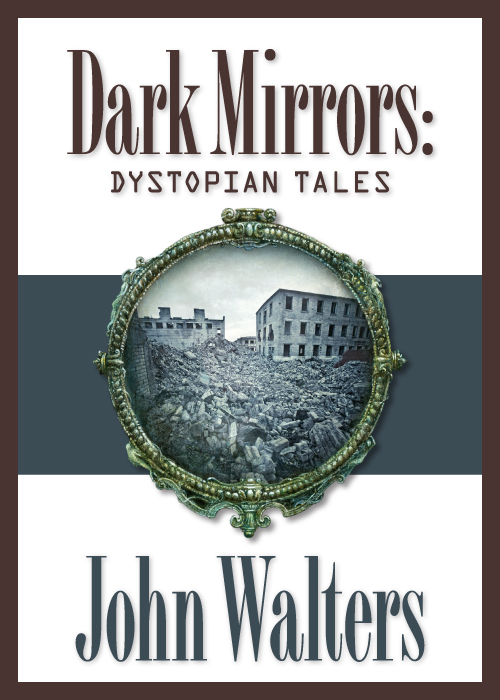 2 Responses to Dark Mirrors: Dystopian Tales – Now Available! Found you through Clarion Blog. Dark Mirrors looks like a pretty cool collection. Just downloaded it to my Kindle. Thanks. Thanks, James. Hope you like it.